built as the national capital of Australia in the 20th century, and Nara, the capital of Japan in the early 8th century. 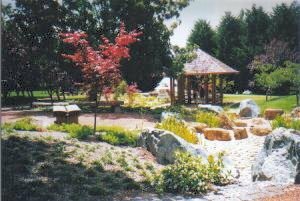 of a Japanese garden including a dry stream bed. 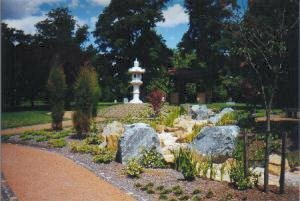 It is the wish of many people in Canberra that this restful place be formally known as Canberra-Nara Peace Park. However, this has not yet occurred because of perceived sensitivities lingering from World War II. 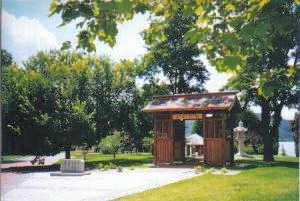 We believe that the wishes of the people are reflected when the park is used as a destination for peace cranes sent from around the world. the Canberra-Nara Sister City Committee. and the backdrop of Black Mountain. 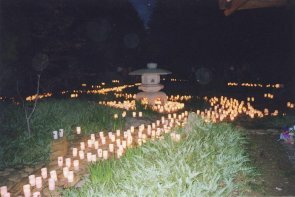 past the dry stream bed and tall lantern. 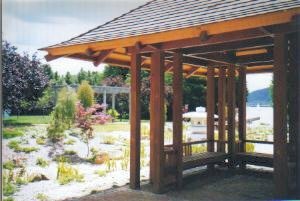 The gazebo seen with the dry stream bed. The lake just is visible through the gap in the trees beyond. are ideal for hanging cranes. The squat lantern and pergola are visible at rear. 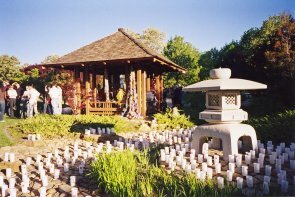 The images below were taken on 30 October 2004 at the Canberra Candle Festival in Canberra-Nara Park, when more than 2,000 candles were lit as symbols of peace and friendship. Our participation in this wonderful event was assisted by the Rotary Club of Canberra Burley Griffin and supported by the ACT Government. We were pleased to be able to exhibit cranes from Australian folders in New South Wales, ACT, Queensland, South Australia and Victoria; from USA folders in Massachusets, Illinois, California, New Jersey and Kentucky; from France; and from Singapore. 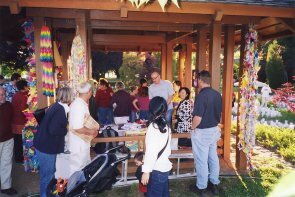 Visitors had the opportunity to learn to fold cranes, thanks to the asistance of the Japan Embassy and the Australian-Japan Society. 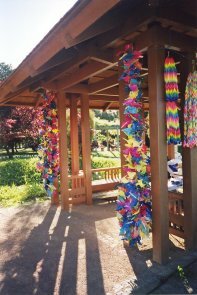 Students from the Japanese class at Holy Spirit Primary School in Nicholls ACT strung folded cranes into garlands for hanging. 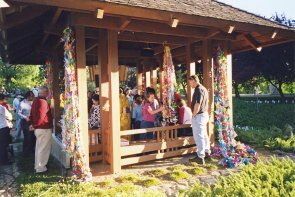 The students also helped to give away folded cranes to thousands of visitors to share a wish for peace. 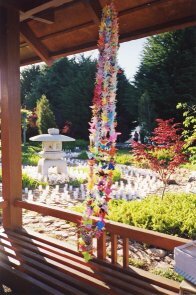 folded cranes, and the many places they had been sent from. . 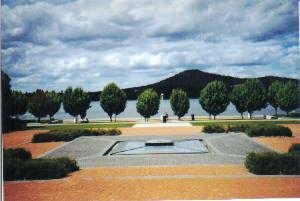 The Canberra Peace Park was established for the International Year of Peace in 1987.
and the absence of any structure from which to hang garlands. However, we may seek to place cranes here from time to time. a central motif and panels inscribed with 'Peace' in many languages. 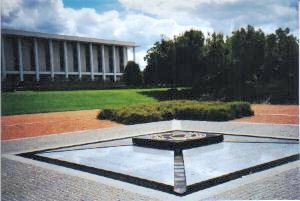 The building at rear is the National Library of Australia. View across the site to Mount Ainslie beyond Lake Burley Griffin. between the National Library and the lake. and as it is not shown on any city maps it is rarely visited.